Washington, D.C. – The International Code Council has selected Jack Applegate, a building official for Northwest Code Professionals in Eugene, Ore., to receive the 2018 ICC Raising the Profile Award. This award recognizes an individual or organization that has increased public awareness about code professionals and the importance of safety in the built environment. Applegate, a code professional with over 30 years of experience, is the president of ICC Region II and the vice chair of the ICC Building Code Action Committee. He is an enthusiastic proponent of building safety and passionately involved in recruiting and training a new generation of code officials. The award will be presented at the Building Safety Month reception sponsored by the National Association of Home Builders on Wednesday, May 30, at the Laborers’ International Union of North America (LIUNA) headquarters in Washington, D.C.
With powerful advancements in technology and frequent discoveries of new methods for solving age-old problems, the building industry, like many industries, is constantly changing. For building safety professionals worldwide, education and training are valuable and essential aspects of professional development. Those who consistently seek out avenues to expand their knowledge often see the most career success. Code officials provide an important service to our communities by ensuring that the buildings where we live, work and play are safe and resilient. Since many code professionals are planning to retire in the next 15 years, there is a tremendous opportunity for those looking for a rewarding, high paying career. 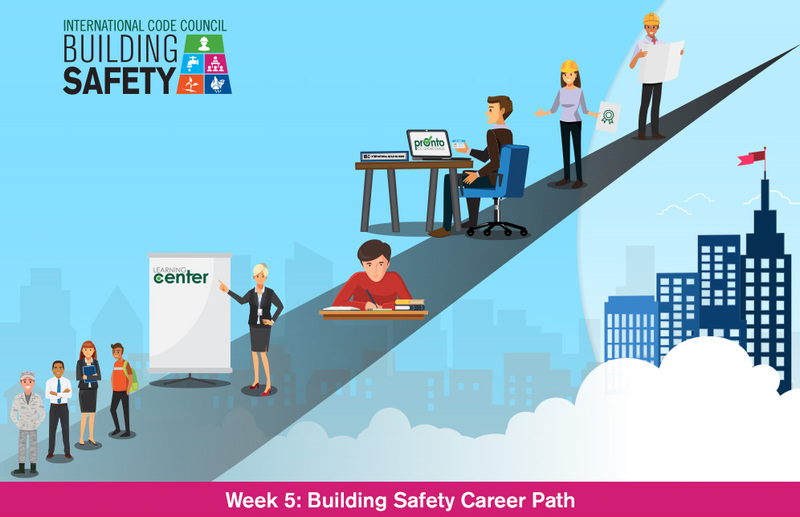 Click here to learn more about the building safety career path in an interactive, digital poster. The National Multifamily Housing Council (NMHC) is also a week 5 Building Safety Month sponsor. “NMHC is committed to providing safe, healthy and affordable housing for the 39 million Americans that call an apartment home. Multifamily owners, operators and residents benefit from building codes and standards that promote safety and efficiency, and we recognize the important role that building codes play in creating thriving communities,” said NMHC Vice President for Construction, Development and Land Use Policy Paula Cino. Visit www.buildingsafetymonth.org for more information, and join the online conversation using the hashtag #ICCBSM18. For a graphic of our week 5 Building Safety Month interactive poster, click here.